I first entered the Prenzlauer Berg studio of Chiharu Shiota one year ago. How quickly a year passes, flying by in the blink of an eye. I took off my shoes at her request: blue or grey slippers? Blue. Shuffling through the large live-work space, I attempted to keep my feet from faltering in the oversized shoes, staring through giant windows that overlooked industrial snaking train lines. Carriages silently glided through, all noise cancelled by thick panes of double-glazing. As a former spy vantage point covertly positioned to look from East into West Berlin, I imagined its past life: a building with a different identity, secretly surveying the enemy beyond the wall. Fast-forward to the present day and, again, here I am at her studio, slipping off my shoes. Shiota comes across as being shy, but simultaneously friendly and sure of herself. Dotted around the studio atop cleanly stacked bookshelves are small cuboid armature frames. Keys appear to be floating within, suspended by Shiota’s signature webs of interwoven thread. Upon a table, drawings are piled high, charcoal smudged and overlaid with delicate watercolour washes outlining faceless silhouettes. Adjacent tins contain multi-coloured pastels; turquoise blue, apple green and electric yellow muted by a fine layer of dust that has settled on their surfaces. 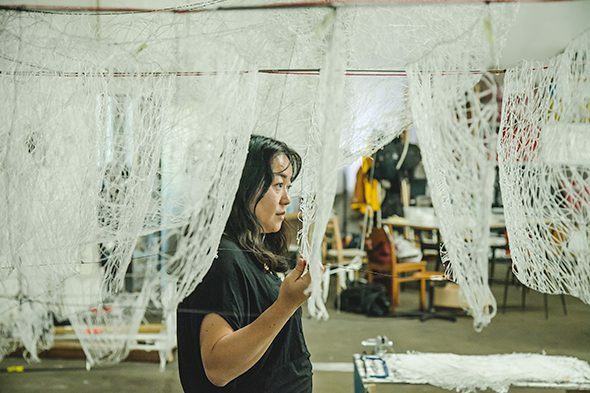 Alongside this more domestic space, Shiota has recently moved into a 1000 square meter warehouse in Wedding: the large scale accommodating her vast installations, as well as her smaller-scale sculptures and paintings. Here, the mood of a bustling experimental workshop is palpable, as the artist and her assistants busily work away. 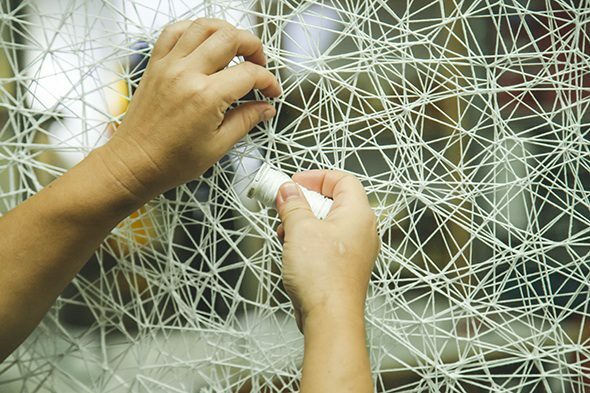 Thread is spooled, fingers then dextrously crisscrossing thread to create complex patterns within frames, upon canvases and, perhaps most poignantly, knitting the skeletal forms of boat hulls. These fairytale-like, ghostly white apparitions hang from the ceiling, gently blowing in the breeze drifting through the door; or perhaps they have floated in from a dream. Next year, the haunting white structures will find their way into the windows of a famous French department store, where they will mesmerise the throngs of Parisians passing by. Throughout Shiota’s oeuvre, boats have recurred as a poetic image suggesting many significations. 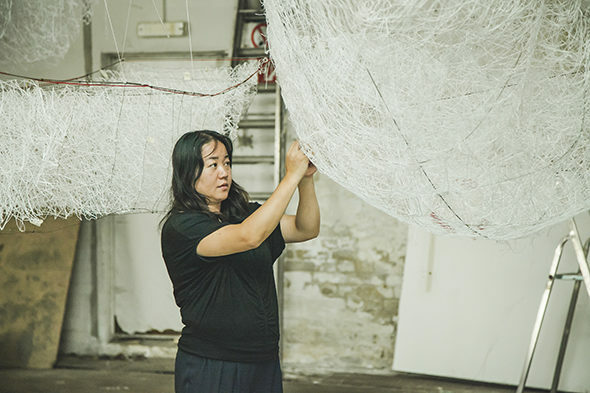 At the recent 2015 Venice Biennale, the artist represented the Japanese Pavillion with her work ‘The Key in the Hand’, two wooden frames connected by complex red webs of thread and keys, a swirling biosphere of cotton and metal. They talk of how culture was historically exported and exchanged via boats; how humans often have to flee unexpectedly, entering into uncertain journeys, referencing not least the millions of refugees who have been displaced as the result of Syria’s war; how we travel when we dream at night; how boats, which carry people, echo the shape of a cupped hand that too carries the memory of objects—keys, for example. Indeed, for Shiota, keys symbolise human life, a large circular head attached to a smaller body. 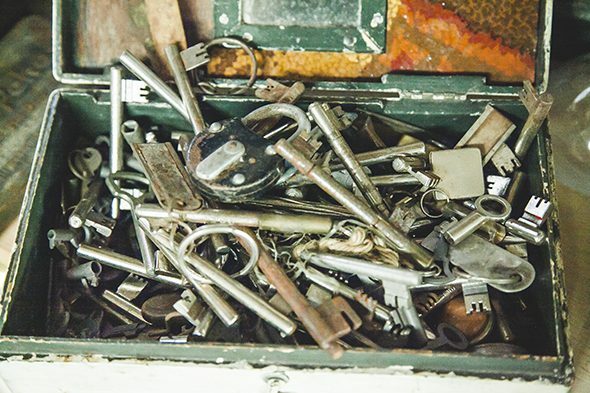 Within her studio, scattered boxes contain piles of disparate keys, all different shapes and sizes, tarnished metals exploring one another’s patina. 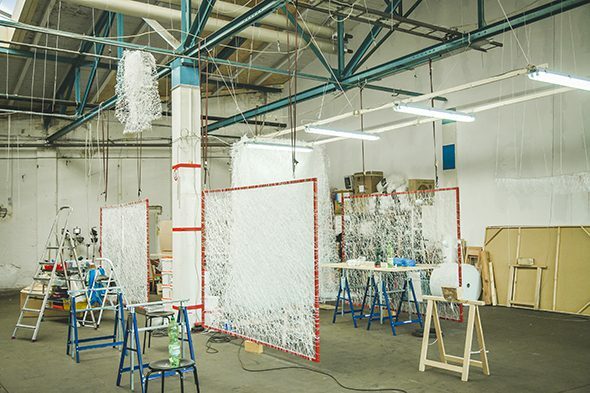 On the eve of her first Berlin-based exhibition in eight years, titled ‘Uncertain Journey’, Shiota reveals images of the almost-complete installation. Within these photographs, skeleton hulls of crisscrossing black metal bob upon a stark concrete floor, washed up with nowhere to go. From each boat carcass, thick webs of thread rise, capillary veins soaring into the space above, meeting and merging to form a placenta-like blood source. The skylight windows illuminate this canopy of red, sun battling to penetrate the thick cellular mass that reaches into the sky, that clings to the walls. Comprised of 360,000 metres of thread–deriving from 2500 balls of red yarn–the scene expresses gestural painting in three dimensions, dynamic brushstrokes of thread continuously layered as a wash of monochrome colour. Consistently working with red and black thread, Shiota describes how “black is, for me, the universe. It is very deep like the night sky. Red is connected to people, like blood: also the universe, but inside the body.” Red represents an internal solar system; veins and blood mirroring the stars and planets as imagined by Shiota in the pitch-black night sky. 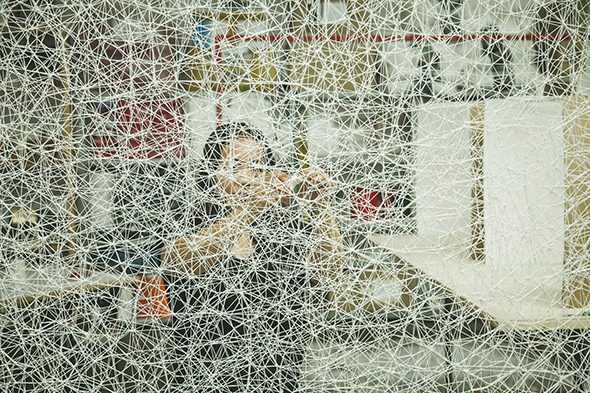 Shiota’s work is elemental, conjuring cellular human life and its symbiotic relationship to the universe as a whole. Last year’s installation, ‘In the beginning was’ (2015), at Fundació Sorigué in Lleida, Spain, elegantly connected earth, body and universe as stones from the foundation’s own quarry were suspended, star-like, amidst a black labyrinthine cosmos of tunnels. Sorigué is a construction company whose foundation has done significant work in commissioning and supporting artistic creation, with its PLANTA project envisioning a space for multidisciplinary artistic production. Other throwaway objects such as window frames, old dresses and shoes have also found their way into her installations. For example, at The National Museum of Art Osaka, ‘Breath of the Spirit’ (2008), saw red lines of thread connecting hundreds of worn shoes. Donated by people with accompanying hand-written letters describing personal memories, each shoe and paper scrap was tenderly connected by the lines of cotton, becoming the inhaled and exhaled breath of each object. 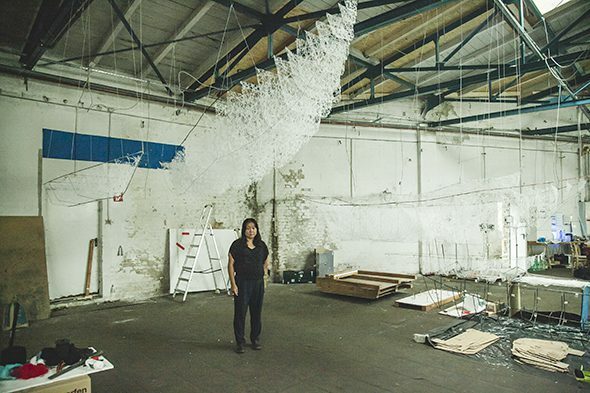 Shiota describes how even when it comes to discarded objects: “I can see the story, the existence. They are absent, but the existence is there. The story and the memory is there. Even if it is an empty boat, there is always a story.” It is these implied layers of history that fascinate the artist: “You cannot touch memory, but it has a very strong existence”. Indeed, her practice aims to make absence tangible, emptiness taking on a material presence: “I very much like empty space, absence. The existence of absence is the big theme of my work”. Perhaps this explains why entering one of Shiota’s installations feels akin to moving through a lucid dream, a simultaneously ethereal and physical experience where surreal scenes claim their own time and space with inescapable strength. This article is part of our BLINK series, which introduces the practices of artists around the world. To read more BLINK articles, click here.